Insurance carriers use credit scores as part of their calculations to determine the level of risk you would pose to them as an insured. They have found a direct correlation between credit scores and claim activity. 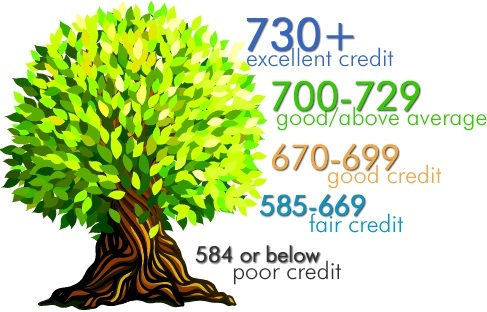 Knowing that, it's important to keep your credit scores in good shape so that your insurance premiums stay in line. Here are 10 ways to increase your credit score by 100 points - most often this can be done within 45 days. Check your credit report. Get a free credit report from each of the three credit reporting agencies (Equifax, Experian and TransUnion) once a year at annualcreditreport.com. Look for errors that lower your credit score and take action to correct them. Review the negative factors in the report and work on improving them, such as paying bills on time or reducing debt. Pay your bills on time. Set up automatic payments using your bank's bill pay service or sign up for e-mail alerts from your credit card company if you sometimes have trouble paying bills before the due date. Pay off any collections. Paying off a collection will increase your score, but be aware that the record of a debt having gone into collection will stay on your credit report for seven years. Get caught up on past-due bills. If you missed a payment, get current as soon as you can. A missing payment can lower your score by as much as 100 points. It may take a some time for this black mark to fade from your credit report, but take heart: your credit score usually depends more on your most recent activity than on past credit problems. Keep balances low on your credit cards. A common rule of thumb is to keep the balance at or below 10 percent on each line of credit to improve your credit score. A balance close to or over the limit will significantly reduce your credit score. Pay off debt rather than continually transferring it. While a balance transfer to pay zero interest or a lower interest rate on your debt can be worthwhile, make sure you pay down the balance before increasing your debt load. FICO says paying down your overall debt is one of the most effective ways to boost your score. Don't close paid-off accounts. Closing unused credit card accounts reduces your available credit and can lower your credit score. Keeping them open and unused shows you can manage credit wisely. And think twice before closing older credit card accounts, because a long credit history improves your score. Shop for new credit over a short time period. If you are shopping for a mortgage, a car loan or a credit card, lenders typically pull your credit report to see if you qualify and to determine the rate they will charge. Too many inquiries over time can negatively impact your score, but if you cluster these applications within a few days or a week, the FICO scoring system will recognize that you are comparing rates for a single new loan or credit card rather than attempting to open multiple new lines of credit. Have a mix of credit types. FICO prefers to see consumers with both installment loans and credit cards . If you are repaying student loans or have a car loan or a mortgage, then having one or two credit cards is also a good idea. While having too many credit cards can be a negative factor, you should have at least one to prove you can handle credit appropriately. Apply for new credit sparingly. Only apply for new credit when you actually need it and not simply to boost your available credit. Opening several new credit accounts in a short time frame can lower your score.